On Saturday, 12/3, our Varsity Basketball team had their first game of the season against Darrow in a HVAL matchup. NYMA won by the score of 62-14. The Knights were led by Will Mayfield who scored 22 points. Zaahir Woody and Mickey Urso also finished with 8 points each. Aside from the basketball team picking up their first win, we had another milestone as our cheerleading team led by coach Stephanie Staudle took the court as well! The squad of Sarah Elhouti, Jedianne Graham, Veronica Walker, and Giana Whritenour were amazing and did the school proud! The Knights were back in action on Sunday, 12/4, as they played host to NYC powerhouse, Our Savior Lutheran, in a non-league matchup. O.S.L. won by a score of 89-70. 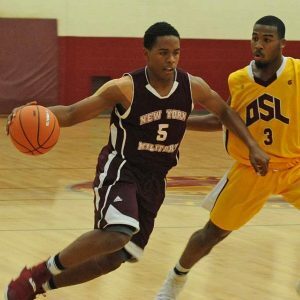 NYMA was led by Zaahir Woody who scored 24 points. The Knights also received balanced scoring from Brandon Evans with 13 points, Will Mayfield with 10, Mickey Urso with 9, Josh Antoine with 8, and Zamere McKenzie with 6 points. The Varsity team (1-1) will take on Faith Christian in a league matchup in Poughkeepsie. The JV Basketball team also started their season on Saturday against the Woodstock Day School. Bob Wang and Remy Sykes led the Knights to victory. On Monday, 12/5, the JV team took the court for their second game versus Oakwood Friends Academy. The Knights again were led by Bob Wang and Remy Sykes as they picked up their second win of the season. Henri Racine and Andrew Weng also had great games for NYMA. The JV team (2-0) returns to the court next Wednesday at home against the Woodhall School.